Stop PressImportant or Urgent info. 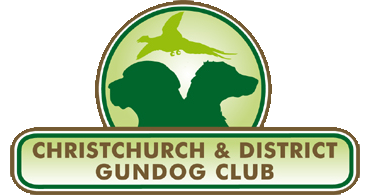 Welcome to Christchurch & District Gundogs, founded in November 2006. We are situated at Three Legged Cross in private fields which provides a safe and relaxed atmosphere for training any breed of gundog. We pride ourselves on being a friendly club and all gundog breeds are welcome of any age or experience. Our training grounds are extensive and we have large fields, rough ground, long grass and other cover and woodland all available for our use. Regular Sunday Morning training is provided every other Sunday rain or shine. We divide the group into Retriever and Spaniel types, the puppies and beginner groups train at 10am and the more advanced dogs at 11am. Lots more information can be found on this website, if you are interested in joining us please make contact using the contact form, preferably, or phone our chairman (but only between 6-9pm please). We endeavour to take new members on a monthly bases. The address of our training ground is Holt Road BH21 6SE, if you would like to locate this on a map click on post code on EVENTS page.